Well what a year that was! Category 5 Cyclone Pam struck Vanuatu on Friday, 13 March 2015 causing incredible damage. Rireana was on her mooring in Port Vila Harbour. We were in Auckland trying to get on a plane to Vila having just flown in from a scoping trip to India and Bangladesh. We had left Rireana on her mooring prior to Christmas. As usual, we had prepared her thoroughly for any potential cyclone. 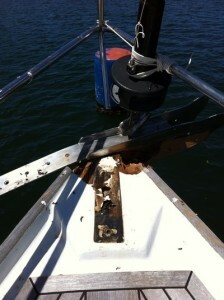 The mooring had been checked, a bridle added as back-up security, and chafe protection put in place. All deck gear had been removed, the boom had been lowered, all halyards and sheets had been removed, and down below, everything had been securely stowed. Rireana was one of about 30 boats moored in the anchorage. On the day after the cyclone, she was one of 5 boats left afloat. Most had been sunk or wrecked on the surrounding coast and reefs. Rireana had sustained some damage when she was hit by another, larger, yacht, which had broken its mooring and now lay wrecked on the beach behind. Rireana’s bowsprit (10mm stainless steel plate) had been bent 90 degrees to starboard and, as the errant vessel bounced down the starboard side, it had broken some stainless steel work and small parts of the rubbing strake. 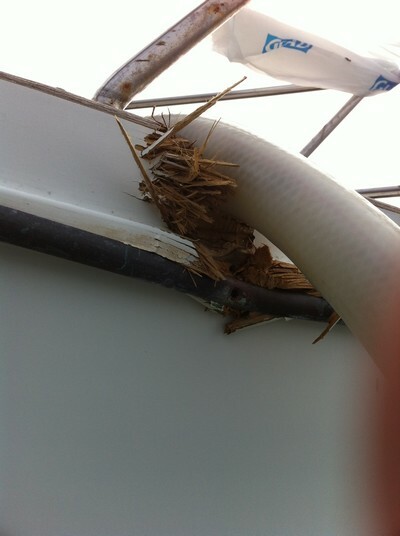 The forestay was also slack as a result of the damage to the bowsprit. Rireana’s builder, Ian Hyde-Hills, did a wonderful job of constructing her. She is very strong but light. 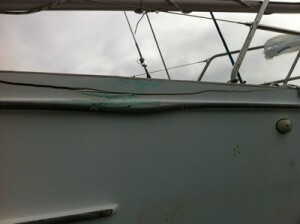 Consequently there was no damage whatsoever to her hull, deck or rigging. 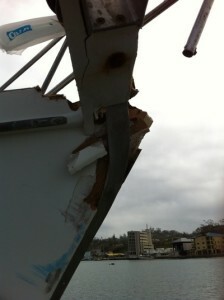 If it hadn’t been for the impact from the other vessel, Rireana would have been completely unscathed. As we worked on cyclone recovery work, Ian came to Vanuatu to help the Butterfly Trust with the re-building, and he also assisted with the repairs to Rireana. At this stage, everything is back in working order, but there is cosmetic work remaining to be done to get her back to her former glory. That will have to be done in 2016 when we have the time to haul her out. Consequently, sailing in 2015 was minimal. The sheer amount of relief and recovery work required us to spend a lot of time in Vila, flying to the outer islands when necessary, instead of taking the more leisurely approach of sailing. A few day sails and a couple of weekends spent at Mele Bay was all the sailing we managed. We are now in the 2015/2016 cyclone season. Rireana is again secure on the same mooring. She will be fine!